Alice’s Adventures in Wonderland is a tale that has been told many times. It tells the story of a bored little girl who follows a white rabbit down a rabbit hole into Wonderland, and her adventures with the strange creatures who live there. The book and its imagery are so firmly entrenched in English literary tradition that the audience even contained several children clearly dressed up as the titular heroine. 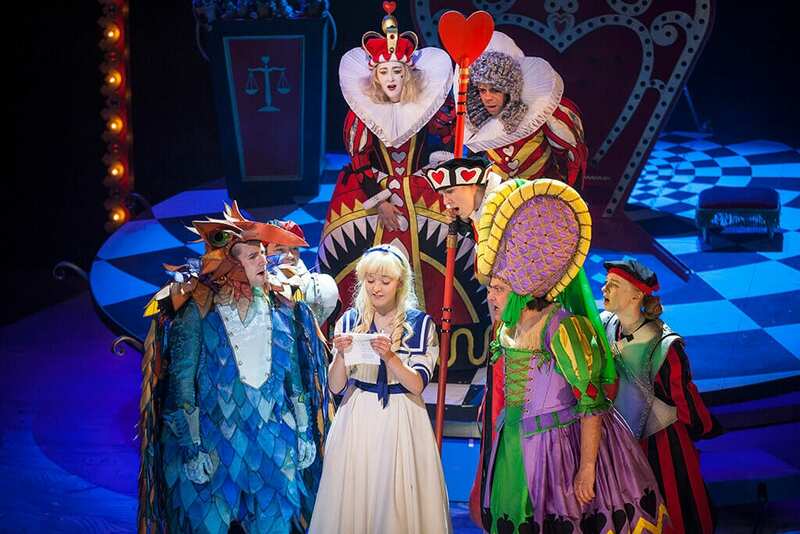 Anthony Neilson’s production of Alice is hardly revolutionary. 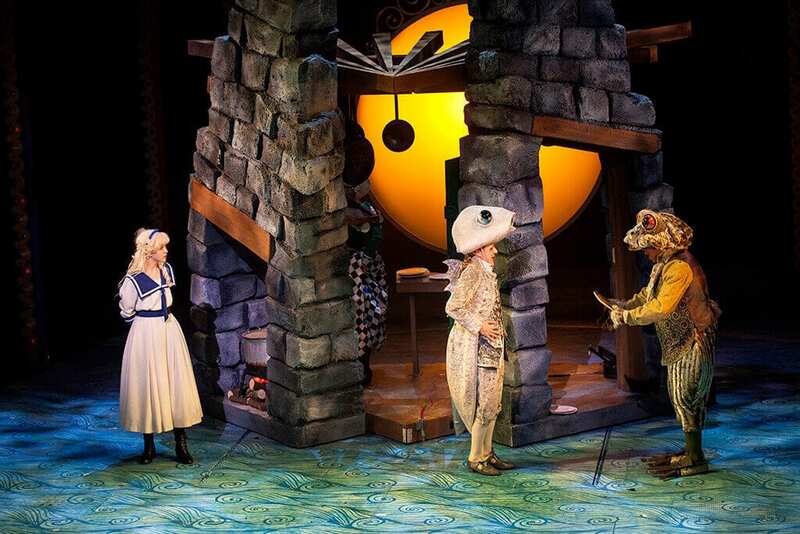 However, it is done with an enthusiasm and panache that will delight its young audience while reminding adults of the many pleasures to be derived from Lewis Carroll’s delightfully silly world. 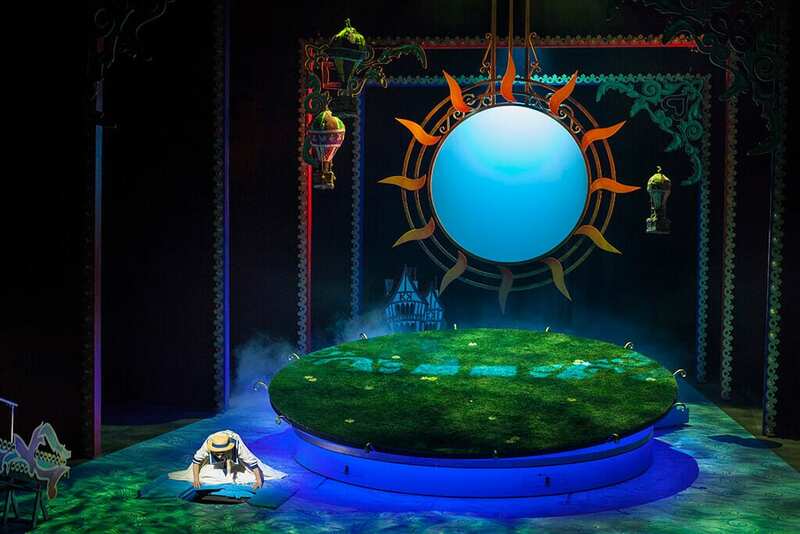 The costumes and set, which go far to creating Wonderland, are sumptuous creations with some clever touches thrown in. Ever present is a giant circular screen, used successively as a baking sun, spiralling rabbit hole, ominous pendulum and hypnotic Cheshire Cat. Rose trees rotate with red and white flowers while a giant turning platform serves as both royal dais and Mad Hatter’s tea party table. The tea party provides possibly the one dull note in the whole production. 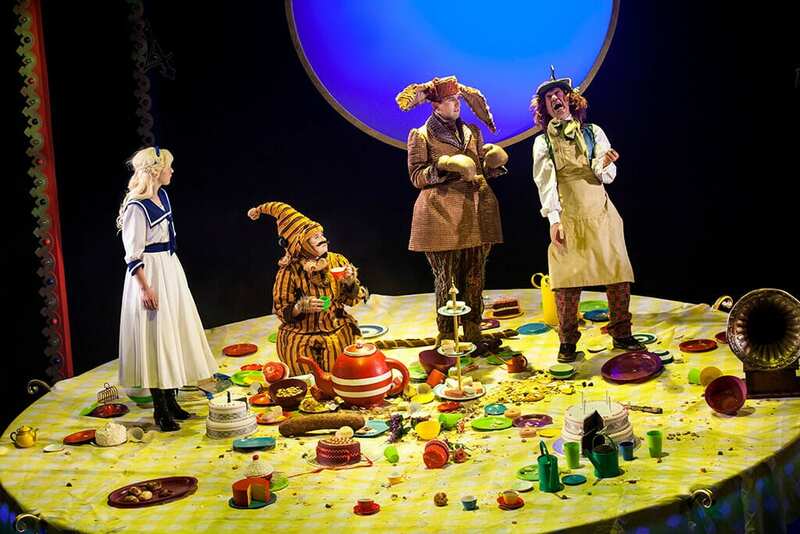 The Hatter (Tam Dean Burn), March Hare (David Carlyle) and Dormouse (Isobel McArthur) simply stamp about their table, flinging plastic crockery around the stage and shouting, to little point or effect. Alternatively, the double act provided by the Mock Turtle (McArthur) and ‘Griff’ the Welsh Gryphon (Carlyle) is a triumph of word play, combining humour and pathos with ease. Likewise, the organised chaos of Alan Francis’ Duchess and his horn-playing, red faced, knowing Baby provides a lesson in how to present organised chaos without it degenerating into just chaos. The audience received Francis and his pepper-covered offspring with all the acclaim any good pantomime dame deserves. The cast change characters with such seamless ability that there seems to be at least twice as many actors as there actually are. The one fixed point is Jess Peet’s Alice, whose china doll face might have come straight out of Sir John Tenniel’s original illustrations of Alice. She can certainly be excused her occasional awkward over-enunciation – Carroll’s careful nonsense deserves to be carefully heard. Throughout, his language is always treated with great respect and much humour is provided simply by the relish with which the cast speak their lines. While several additions and adaptions to the text are inserted to raise a chuckle or two out of the parents – Bill the Lizard’s offer to remove small children being particularly well received – they never feel forced or out of character. 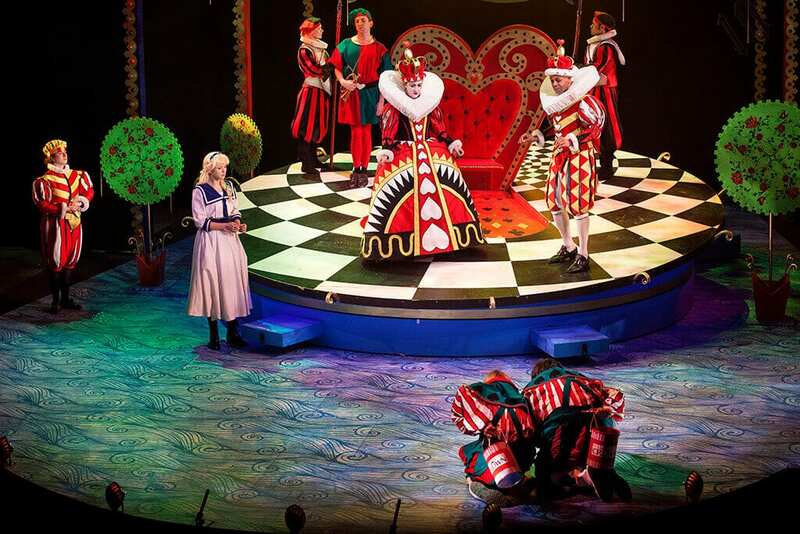 Indeed, the Wonderland world permeates every aspect of the production: from the asymmetrical programme stuffed with word games and recipes for jam tarts, through casual references to whether or not ‘a Jabberwocky gimbles in the wabe’, to the Benny Hill-style curtain call with characters popping up all over the theatre and throwing confetti.